First, what is crime fiction? Broadly defined, crime fiction explores crimes (unlawful or prohibited acts) and the lives and motives of perpetrators, victims and investigators. Crime stories also often show, through secondary characters, the various ways crimes’ aftermaths spill out and touch the lives of others, from witnesses to the friends and families of perpetrators and victims. The idea of motive is key in crime stories. Because when a person commits an act with severe possible consequences (incarceration, or even death), we typically want to know the underlying cause or reason. It may be rational/calculated, emotional (as in a ‘crime of passion’) or a mixture of the two. Desire is the lifeblood of stories – and not only crime fiction. From the fairy tale Cinderella to hardboiled detective novels such as Raymond Chandler’s The Big Sleep (1939), characters have to want something that motivates their actions. Compulsion: For example, killers who feel compelled to reenact traumatic experiences of their youths. Interesting motivations in crime fiction involve emotional and/or rational elements. This interesting mix of motives – financial desperation and shame on one hand, and righteous self-justification on the other – creates interesting motives. It also makes Rodion a complex, at times sympathetic (and at others monstrous) character. Brainstorm equally interesting characters in the ‘Characters’ section of the Now Novel dashboard. One of the fascinating and dramatic (and so often tragic) elements of crime is how it ripples out and touches many lives. Good writers know that crime is an entree into telling a greater story about character. Good crime writing holds up a mirror to the readers and reflects in a darker light the world in which they live. Crime begins after an extreme, ‘final’ event (be it murder, a devastating theft, or something else). After crime, we see how characters begin to deal – interpret, solve, live – with crime’s effects. A crime story that captures this sense of aftermath expertly is David Lynch’s cult classic detective show, Twin Peaks. The opening scenes of the pilot episode construct a chilling sense of aftermath. We see the murder victim’s empty chair in her class at school, for example, as her surrounding friends and classmates start to notice her absence and one bursts into sobs, knowing her well enough to realize something ominous is afoot. This effect of ‘piecing together’ what happened after the event is compelling. The snow in the mountains was melting and Bunny had been dead for several weeks before we came to understand the gravity of our situation. He’d been dead for ten days before they found him, you know. It was one of the biggest manhunts in Vermont history—state troopers, the FBI, even an army helicopter; the college closed, the dye factory in Hampden shut down, people coming from New Hampshire, upstate New York, as far away as Boston. Donna Tartt, The Secret History, p. 3. 1992. 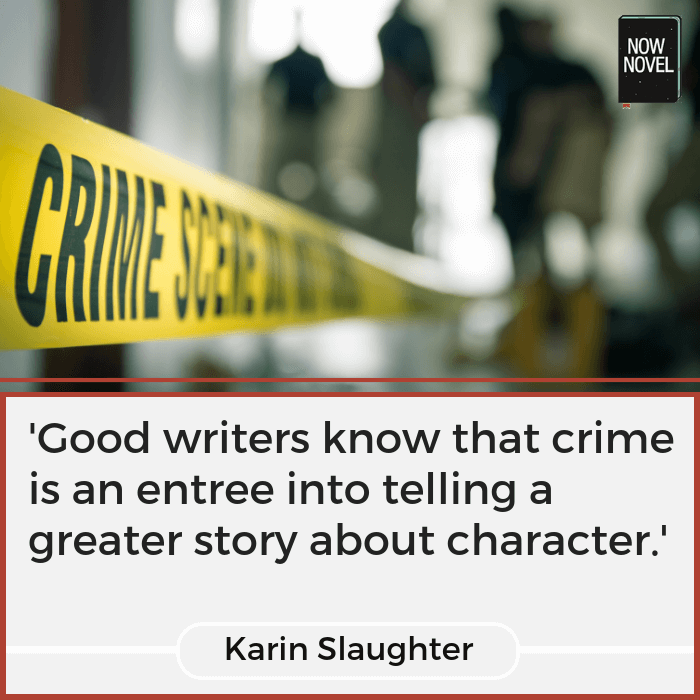 Karin Slaughter’s statement that ‘crime is an entre into telling a greater story about character’ strikes an important point. Crime novels are often formulaic in their structure, in that at the end we know there will be some sort of revelation and/or show down. The criminal will be apprehended. The crime will be solved. But along the way we meet interesting, flawed (and thus human) characters. Many authors play with these ‘givens’ too, of course. Some killers are never apprehended. Sometimes they’re the twisted protagonist and narrator. Whatever crime you prefer to write – traditional or non- – make characters interesting. How? …[he] keeps his cigars in the coal-scuttle, his tobacco in the toe end of a Persian slipper, and his unanswered correspondence transfixed by a jack-knife into the very centre of his wooden mantelpiece … He had a horror of destroying documents…. Thus month after month his papers accumulated, until every corner of the room was stacked with bundles of manuscript which were on no account to be burned, and which could not be put away save by their owner. Watson’s description of his friend creates a clear sense of Holmes as the sort of detective who appears chaotic but has their own system. Details of consistent characterization will make characters more interesting and individualized. 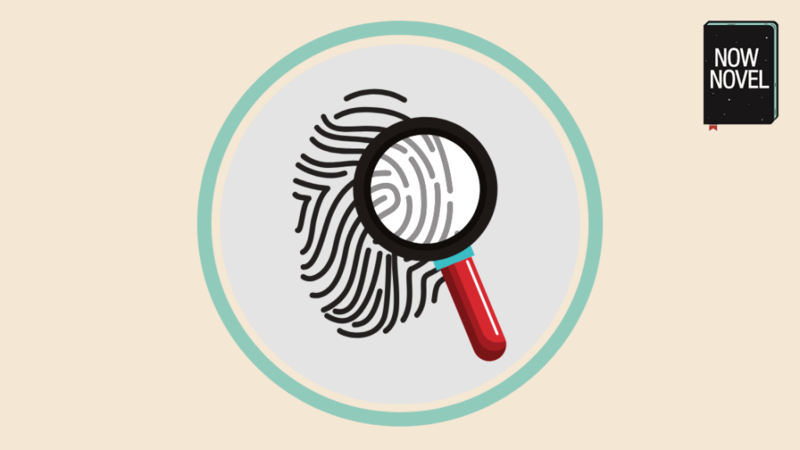 Think of details that reveal key facts about the type of methods a detective favors, or the quirks of lifestyle a criminal leads that could give them away. 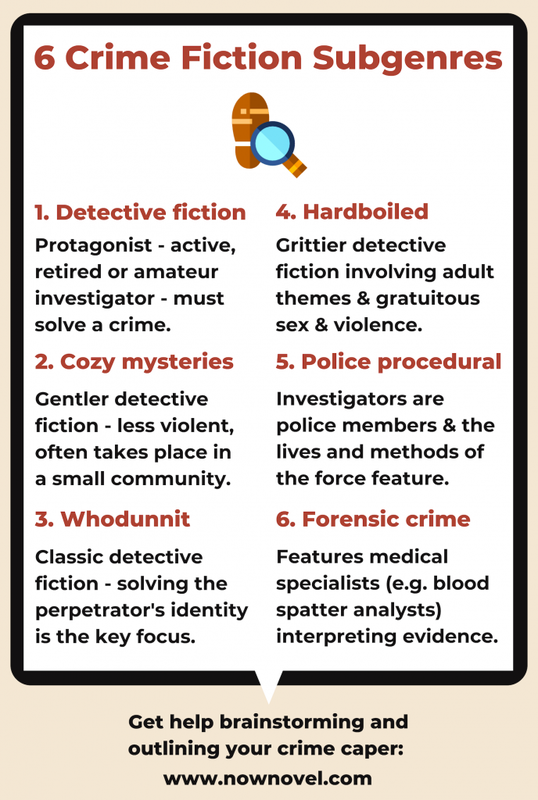 Many subgenres of crime fiction focus particularly on the intricacies of plot. In a ‘whodunnit’, for example, our focus is on identifying the killer (or other perpetrator type). Twists typically involve the difference between appearance and reality, or between hypothesis (idea of what could have happened, what x sign could mean) and reality. Find ways to mislead readers (and investigators) using devices such as red herrings (irrelevant details that at first seem significant). Tension is a key element of writing crime novels. Narrative tension occurs when we find ourselves needing to know what happens next (because the present story situation begs resolution of some kind). How can your setting contribute to unease or a sense of menace being afoot? In Twin Peaks, the director creates a sense of menace using simple means. For example, the camera lingers on a relentlessly turning ceiling fan in a dimly lit house as the victim’s mother searches increasingly anxiously for her daughter upstairs and downstairs, discovering she is not home as expected. Use ominous or unnerving details (such as light and dark, objects that cast an unnerving effect like lynch’s ceiling fan). Cryptic, guarded dialogue is capable of making every character seem like a suspect or shady figure. The local recluse who only opens her door a crack to speak to a detective and is full of fear and suspicion, for example, might seem like she knows something. Milk the power of characters ‘speaking slant’, giving some information, but not enough. Tense actions in crime novels often imply threat. For example actions that imply impending violence or bad intentions (polishing or hiding a gun, wheeling liquid flammables to a creepy hut in the woods). To sustain tension and suspense, describe actions but delay revealing their meaning or follow-through. Playing with the pace of revealing key information – the significance of creepy or unnerving actions – is a key tactic for tense and gradual revelation. Join Now Novel and get feedback on your crime writing as well as tools to brainstorm and outline complex detectives, mastermind killers and more.